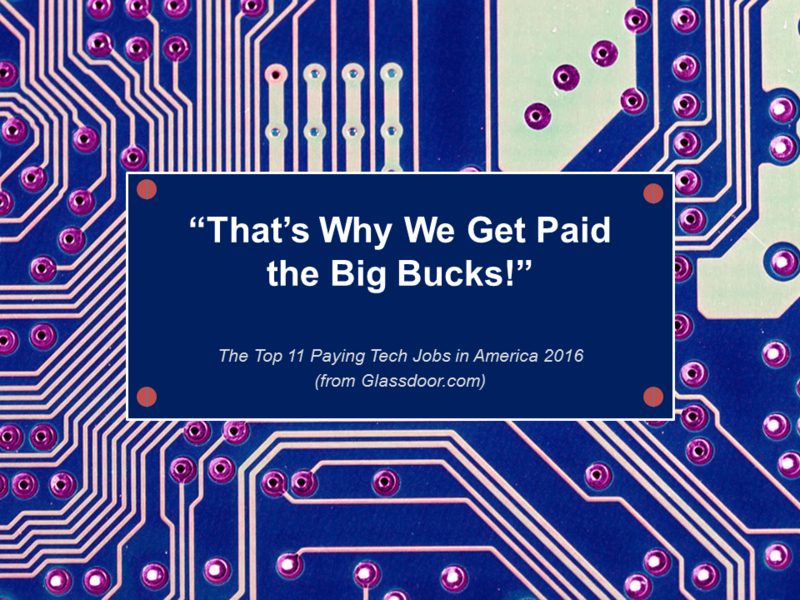 Glassdoor, a top jobs and recruiting site, recently released their annual list of top paying jobs in America. Unsurprisingly, jobs in the Information and Technology sector dominated much of the list, making up 11 out of the 25 top paying jobs. Information and Technology positions are critical to data security, strategy development, and the productivity of most companies and require a great deal of technical know-how. It is no wonder that these roles command top dollar! Take a look at the presentation below to see position titles, median base salary, and a description of the role. Job Description: Accomplishes information systems objectives by managing staff; designing and monitoring information systems. Job Description: Analytics managers provide the company’s top executives with summarized and current data to be used in making the most appropriate and strategic decisions involving the company. Job Description: Develops products by identifying potential products; conducting market research; generating product requirements; determining specifications, production timetables, pricing, and time- integrated plans for product introduction; developing marketing strategies. Job Description: Maintains database by determining structural requirements; developing and installing solutions. Job Description: Run data systems and leverage technology to find insights in massive amounts of data. Job Description: Designs information systems to be implemented according to an organization’s goals, needs and objectives. They establish a system’s basic structure, defining essential design features and providing a framework for developers to follow. Job Description: The applications development manager performs work of considerable difficulty in planning, assigning and directing computer applications program design, development and implementation. Job Description: The solutions architect is responsible for solution design, evaluation and implementation of software solutions. Assists in the design of IT systems. Job Description: Maintains information technology strategies by managing staff; researching and implementing technological strategic solutions. Job Description: Software expert who makes high-level design choices and dictates technical standards, including software coding standards, tools, and platforms. Job Description: Envisions product development and manages projects through completion; analyzes, designs and develops software enhancements and new modules; manages development project from initial design through testing while providing strategic management direction. Advanced Resources’ Technology Division delivers the full spectrum of IT talent for organizations that need on-demand technical expertise. Our talent will help you execute critical IT projects and/or manage daily operations. Our experienced technology recruiters have in-depth knowledge of Chicagoland’s local market dynamics and their personal connections will help you get the IT talent you need to succeed. Watch the video and learn more here.